Champion Shuffleboard Bank Shot Game Table - 7 Ft.
Champion Bank Shot Shuffleboard Table - 7 ft. Add bowling pins and you have another way to challenge your family and friends. And makes everyone a player! Available in oak or maple veneer. (They may place it in your garage, but are not required to do so.). The glide out Perfect Drawer, mounted under the table, is ideal for storing all of your shuffleboard parts and accessories. 9' Black Onyx Shuffleboard. Storage: All shuffleboards include the Perfect Drawer. We specialize in Shuffleboard Supplies! Champion Worthington Shuffleboard Table - 22 Ft. The Worthington Shuffleboard Table is in a class by itself. Solid maple cabinet. Weight: 50 lbs. 12 - 22 ft. long. Cradle Lengths: 12' - 22'. Playfield Size: 3" thick x 20" wide. Height: 30" to the top of the playfield. Shuffleboard Puck Weight Indoor shuffle board Set. Shuffleboard puck weight set. Each puck is 12.6 oz. approximate weight. Red and blue complete set of 8 pucks. Champion Qualifier Shuffleboard Table - 9 Ft.
Presenting the Qualifier Series. The Qualifier Series is designed to fit any office, family room, school or recreation room. Length (in.). Width (in.). Height (in.). (They may place it in your garage, but are not required to do so.). Champion Championship Shuffleboard Table - 20 Ft. This coating is applied directly over the Canadian Maple plank to provide a fantastic playing surface that NEVER requires re-finishing. Champion's electronics are the finest available and now include actual voice sounds. The entire table is made from 100% solid hardwood, no plywood or MDF. The cabinet finish is second to none and incorporates a 14-step stain and lacquer process to ensure the high quality, furniture like finish you would expect from a table of this caliber. Champion Championship Shuffleboard Table - 22 Ft.
Champion Qualifier Shuffleboard Table - 12 Ft.
Presenting the Qualifier Series. The Qualifier Series is designed to fit any office, family room, school or recreation room. Orders under 70 lbs Orders over 70 lbs Length (in.). Width (in.). Height (in.). Champion Qualifier Shuffleboard Table - 14 Ft.
New Red & Blue Shuffleboard Pucks/Weights. These large weights are the perfect size for a 12' to 22' shuffleboard table. Set includes 4 red weights and 4 blue weights. 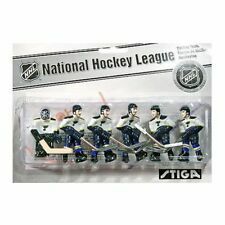 Deluxe Plastic Top Weight/Puck Set (8 weights) - 2 1/4" (size=large). 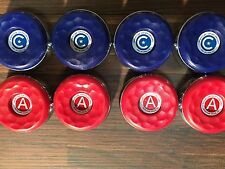 One Set of 2 5/16 Large Shuffleboard Pucks (Red/Blue). You will receive 8 pucks. Confused about which sizes or style pucks you want?. NO SETUP REQUIRED: Your fully built 2 in 1 curling and shuffleboard set is ready to go. SMOOTH SLIDING PUCKS: We engineered our pucks to slide smoothly by using a high-quality steel ball bearing. QUALITY CONSTRUCTION: We at Franklin Sports designed this item to hold up for years. ZIEGLERWORLD TABLE SHUFFLBOARD PUCKS. Why buy ZieglerWorld Pucks?. ZieglerWorld Quality! 4 YELLOW GOLD PUCKS. Get the pucks you want in the color you want! 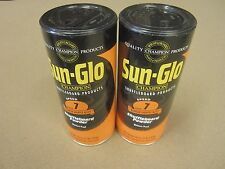 Want one of our other colors?. ZIEGLERWORLD TABLE SHUFFLBOARD PUCKS. Why buy ZieglerWorld Pucks?. ZieglerWorld Quality! Table Shuffleboard Bowling. 4 YELLOW/GOLD PUCKS AND 4 BLACK PUCKS. Get the pucks you want in the color you want! Made of Heavy Duty Vinyl Softex Material with Cloth Backing! 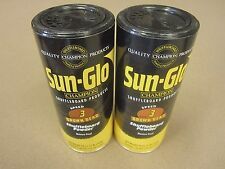 A must to keep your table in GREAT Shape! 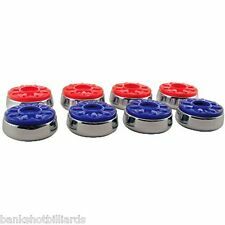 TABLE SHUFFLEBOARD MEDIUM PUCKS WEIGHTS + STARTER KIT - BEST EBAY DEAL! You will receive 8 pucks. 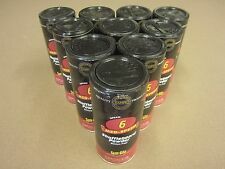 This is Speed #6 Powder. Table Shuffleboard T-Square - NEW CLEAR COLOR! "The Protector" Shuffleboard Puck Case. 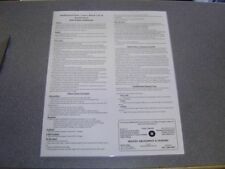 Zieglerworld Table Shuffleboard Rule Booklet. Table Shuffleboard Bowling. The Worthington Shuffleboard Table is in a class by itself. Solid maple cabinet. (They may place it in your garage, but are not required to do so.). 12 - 22 ft. long. Cradle Lengths: 12' - 22'. Coin Operated?. Champion Madison Shuffleboard Table - 22 Ft. The Madison Shuffleboard table has clean lines that present understated grace and elegance. This beautiful design partnered with the finest playfield, continues to make Champion Shuffleboard tables the most recognized and respected anywhere. ZIEGLERWORLD TABLE SHUFFLBOARD PUCKS. Why buy ZieglerWorld Pucks?. ZieglerWorld Quality! Get the pucks you want in the color you want! Want one of our other colors?. Regulation 2. Made in the U.S.A.
ZIEGLERWORLD TABLE SHUFFLBOARD PUCKS. Why buy ZieglerWorld Pucks?. ZieglerWorld Quality! 4 PURPLE PUCKS. Get the pucks you want in the color you want! Want one of our other colors?. Bonus #1 - You will also receive the Zieglerworld Shuffleboard booklet. Table Shuffleboard Bowling. 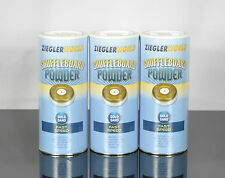 We specialize in Shuffleboard Supplies! Large size pucks are used on tables longer than 14 feet. One set --4 Blue and 4 Red Pucks. Champion Gentry Shuffleboard Table - 12 Ft.
Champion Shuffleboard introduces the Gentry. And, has hand-crafted solid maple legs. The options range from scoring units to the stain and logo on the board. The playfield is always 16" less than the overall length. You will receive 8 pucks. Large size pucks are used on tables longer than 14 feet. This is Speed #1 Powder. 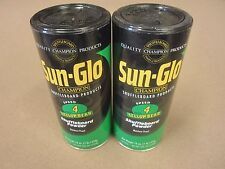 Sun-Glo Table Shuffleboard T-Square. "The Protector" Shuffleboard Puck Case. Zieglerworld Table Shuffleboard Rule Booklet. ZIEGLERWORLD TABLE SHUFFLBOARD PUCKS. Why buy ZieglerWorld Pucks?. ZieglerWorld Quality! 4 HOT PINK PUCKS. Get the pucks you want in the color you want! Want one of our other colors?. Classic Bowling. Split Second Bowling Other Features Leader Of The Puck. (They may place it in your garage, but are not required to do so.). Only 5 1/2' Long, Can Fit Anywhere. No Wax Ever! No Climate Adjusting Needed. ZIEGLERWORLD TABLE SHUFFLBOARD PUCKS. Why buy ZieglerWorld Pucks?. ZieglerWorld Quality! Table Shuffleboard Bowling. Get the pucks you want in the color you want! Want one of our other colors?. Tap & Draw. Another Bonus - You will also receive the Zieglerworld Shuffleboard booklet. You will receive 8 pucks. Table Shuffleboard Bowling. Confused about which sizes or style pucks you want?. Large size pucks are used on tables longer than 14 feet. I am not sure what all they will fit. I have several available. Shuffleboard Playing Pucks. This the most commonly used Puck size. Therefore, it may appear that it is not moving, but that is probably not the case. ZIEGLERWORLD TABLE SHUFFLBOARD PUCKS. Why buy ZieglerWorld Pucks?. ZieglerWorld Quality! Table Shuffleboard Bowling. Get the pucks you want in the color you want! Want one of our other colors?. Available in 21 exciting colors to match your favorite team. Table shuffleboard is the classic game where players slide pucks across the table towards specific scoring areas. To successfully play shuffleboard at home or at the office, players need a variety of equipment, ranging from the table itself to maintenance products. How do I select a shuffleboard table? Length: It's important to choose the right size shuffleboard table. Before buying, measure the room where the table is going to be installed. If the table is going to be placed in a home, smaller 9-foot-long tables may be appropriate. For larger spaces, players can find shuffleboard tables that measure 22 feet. Width: To maximize gameplay, choose a shuffleboard table that is at least 18 inches wide. This gives players room to play the game. Players won't have room to maneuver with widths smaller than that. Finish: When tables are treated with high-quality finishes, like polymer epoxy, the discs slide freely and accurately across the playing surface. Top-notch finishes also ensure longevity, as they protect shuffleboard tables from cracks and scratches. Thickness: It's important to choose a table that is sturdy. Look for a thickness of two or three inches. Some high-quality shuffleboard tables are made out of solid wood, which is the most sturdy. What additional shuffleboard equipment is needed? Discs: The game simply can't be played without discs, which are also known as weights and pucks. To ensure accuracy, they need to be appropriately balanced; many of them have plastic tops and steel bodies. Bowling Pins and Pinsetter: Shuffleboards can be converted into miniature bowling alleys with a set of shuffleboard pins. Scorers: To keep track of points earned, scorers are essential. Traditionally, players use abacus scorers, but there are many options to choose from. Lights: To illuminate nighttime play, players can attach specially designed lights to the sides of the table. What products help players maintain their shuffleboard tables? Wax: To keep shuffleboard tables clean and ready for the next game, most people use a combination of waxes and cleaning sprays. Shuffleboard Brushes: Shuffleboard brushes are used to buff shuffleboard wax to keep the playfield surface smooth and clean. Table Cover: Specialty shuffleboard table covers are designed to fit snugly over shuffleboard tables to keep dust off the play surface. 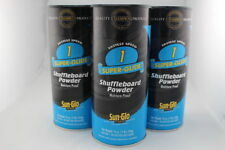 Shuffleboard Powder: New and expert players alike can use specialty powders to increase speed and accuracy.